When it comes to golf clubs, most people will be more familiar with the putters even if they only have a slight interest in this game. Nearly everyone understands the part that a putter will play on the course, yet only the golfers truly appreciates this fantastic tool. Even though all the clubs require careful detail, the putter generally needs a level of finesse that is similar to a brain surgeon, which is the reason why it's important to select the right club from the start. The following will highlight the Top 5 MOI Putters That Make It Easy for Short Putts. Considering the basic function of a putter, inexperienced golfers might be surprised at the wide range of available styles. These dissimilarities are more than trivial, so casual and amateur players must not assume that one will be as good as the other. Black Velvet Model 110: This is a traditional putter with a recognizable club head that is ideal for golfers who like the elegant style of the traditional clubs. With the amount of oddly designed putters available nowadays, even the most youthful aspiring golfers might like the simple design of this putter. Stylish and effective, the mallet style head comes with a polymer insert that is machine made. Big Mo High MOI: This is the most non-traditional looking putter in this line-up, but casual and amateurs players must not disregard the design as gimmickry. This has a square, large mallet style head that will enable impressive robust putts. Just as the name suggests, golfers who need a forceful putt can benefit from this tool. LH Zinc: If you are looking for putter with a blade style head, then this one will offer good value. Of course, the zinc might be as basic as it can get, but you should not be fooled into disregarding this putter for a extra mini golf club. This will be ideal choice for beginners because of the head with genuine copper insert that is soft and covered with polymer. Lynx HE 2: Similar to the Big Mo, this is a heavy putter having a large club head made for high MOI putts. This putter has a large grip and significant weight distribution, catering to a very unique kind of player who wants mallet putters with plenty of heft. Whilst it might not be the ideal putter for all golfers the top quality structure makes it a good option. Nextt Pro Score Copper Blade: This will be the ideal choice for players who have a preference for blade style heads instead of mallets. Besides its glossy black color and striking copper finish, it is specifically made for optimum accuracy and alignment. When it comes to the very important process of correctly aligning putts, casual and amateur golfers will not be sorry for selecting this club. One of the top 5 most expensive putters is the GoldenPutter which was just released from Barth & Sons. The GoldenPutter is dubbed as the First Special Lady Edition and all but encrusted with beautiful crystals. Functional and exclusive in design, the GoldenPutter is custom made and has a 24ct hard gold-plated shaft and a rich leather grip. As one of the top 5 most expensive putters it is available in a variety of crystal hues and leather wrapped cherry wood. The head of the GoldenPutter sports crystal inlays and come in at the price of $3,900 which indeed makes it one of the top 5 most expensive putters around on the market today. The GoldenPutter comes with a certificate of genuineness. The GoldenPutter can also be custom crafted in all its technical precision in gems and diamonds, which significantly raises the price of this putter and qualifies it a spot in the top 5 most expensive putters available on the market today. As part of the top 5 most expensive putters on the market today the Scotty Cameron putters can come in for over $1500 for a Titleist. The average cost of a Titleist Scotty Cameron Studio Select Newport putter will run around $300. The Scotty Cameron by Titleist Studio Select has putters around $300 and above like the Coronado PutterA with a double-step flange and a flow neck. The Studio Select Series also sports their 303 stainless steel putters with bold red tour graphics. The Five Stars golf putters, designed by Honma are Japanese custom clubs and ease into the top spot of being the most expensive customized putter. These putters come in at the cost of $32,000 for the full set of fourteen Five Star clubs. The mass marketed Honma Beres TW914 Fairway Wood 5W Stiff ArmrQ UD62 comes in at a more reasonable price at around $630 for the 18 grams of tungsten nickel weighted putter. A definite heavy-weight price in the category of the top 5 most expensive putters, the Hohma Series gives some serious thought into quality and durability with their line of putters. Another very pricy putter in the top 5 most expensive putters is a jewel of a putter from the Odyssey line. The Odyssey diamond-encrusted putter is a shoe-in for being one of the top 5 most expensive putters on the market today. The 18-carat white gold head sports a stunning two-hundred rubies and three hundred and seventy-eight diamonds at a price of $161,000. Although it is aimed at collectors, the Odyssey putter is showboat when it comes to expensive putters. The average cost of a mass marketed Odyssey putter is in the price range of $350 like the Odyssey Ti-Hot #2 putter for a right hander. It is a limited edition putter with only twelve-hundred and fifty putters made. 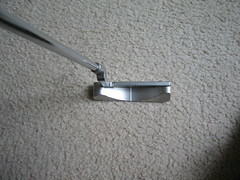 Constructed out of pure titanium, this putter is 34 inches and may well be worth it as a high-end putter on the greens. 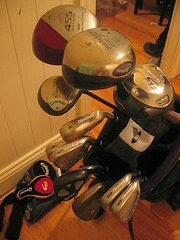 Not to be left out of the top 5 most expensive putters, is the Ping putters. Known globally for their quality performance for putters, drivers and irons, Ping putters are priced around $270 and well worth their prices. The Ping Redwood Series Putter D66 sports a black satin finished and is made from 303 stainless steel in a classic and classy putter priced just under $300. Cleveland HUNTINGTON BEACH 3 Putter 33"
Something called Charl Schwartzel (or as I affectionately refer to him, Charles Schwab) is the 2011 Masters Champion, winning what quite possibly might be the most exciting golf tournament ever played. Coming down the home stretch on Sunday afternoon, at one point there were 9 golfers within two shots of the lead, on the back nine. That's unprecedented, and quite frankly, nuts. Here are some of the highlights, and lowlights according to me from what truly was a masterful tournament. I don't know who the hell Schwartzel is, or where he came from, but the dude has some giant stones. Birdieing the last four holes at Augusta National with a packed leaderboard was insane. Apparently he's a protege of Ernie Els, and I have no idea what that exactly means, but the Big Smooth taught him well. 2010 was a nuts year for guys winning majors who have never even been relevant prior to their win (Mickelson was the exception of course) and it looks like with 'ol Charlie Schwab winning the first major of 2011 that trend will continue. I can only feel so bad for Rory McIlroy. The kid is uber talented and I fully expect him to win a few majors in his career, unless he turns into Sergio Garcia. He's only 21 with a ton of talent, but man, when he gacked he definitely did it in style. That was not the wheels coming off, that was the car blowing up. At about 1:00 this afternoon he was probably thinking about all the red headed Irish babes he was going to be pulling with his new green jacket , and 3 hours later he had to be thinking how many of those babes would have shot better than 80 in the final round of the Masters. There is going to be a lot of talk about how Tiger is back, he's not. He had a great round today and made an exciting charge, but remember, he finished 4th in this same tournament last year, and went on to do squat since. Augusta National, more than any other course I've ever seen is crazy for how the past champions always play well there. I mean Fred Couples, who can barely even walk four rounds was in contention as late as Saturday. Angel Cabrera who looks like a garbage man, and has been playing like one for almost 2 years damn near won the tournament today. So, Tiger contending was not surprising at all, but believe me, he's a long way from being back for one reason and one reason only, he can't putt. Plain and simple. He had 33 putts on Saturday! Turn that number into the normal 26-28 putts, and you throw in the missed eagle on Sunday at 15, and Tiger should have won the tournament by 4 strokes easy. Until he figures out the flat stick he'll continue to finish in the top ten on pure ball striking, but until that point I don't see him winning. The only major where he'll be able to pull off such shoddy putting is the British Open, he'll be lucky to make the cut at the U.S. Open putting that way. The announcers mentioned it a couple of times, but I do think it's true, nobody is scared of Tiger anymore, and they shouldn't be. I think Charlie Schwab aside, this tournament was huge for several players. Adam Scott, Jason Day, Luke Donald, these guys are coming away from the weekend knowing they can win a major now. Speaking of Donald, I'm no fashionista, but what in the blue hell was he wearing Saturday? It might be the only time I was actually grateful I didn't own a hi-def television. On the top half he looked like Pepto Bismol, and the bottom half he looked like what happens if you don't take Pepto Bismol. I know these European guys like to be eccentric, but give me a break.